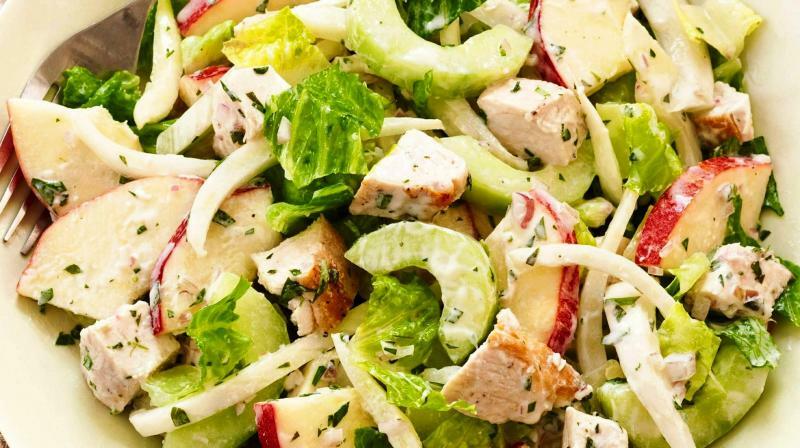 Cucumber, fennel, apples and romaine sing in this salad. Washington: Settle on a mix of flavours and textures, selecting cucumber, fennel, apples and romaine. Red onion added a bit of sharpness, and a modest amount of crumbled goat cheese offered a creamy textural contrast. Lightly salt the cucumber to remove excess moisture, allowing it to drain in a colander. Poaching the chicken in a steamer basket enabled us to use no extra fat. Once the chicken cooled, cut the breasts into chunks and combined the pieces with the other salad ingredients. Whisk the goat cheese into the dressing in place of some of the oil, and you will find that marinating the heartier ingredients in the dressing for just five minutes before adding the romaine infused every component with flavour while still keeping it fresh and light. Use any sweet apple here, such as Fuji, Jonagold, Pink Lady, Jonathan, Macoun, or Gala.